Caught, the latest production at the Theatre Passe Muraille backspace, is 75 minutes of interrogation intensity that drags up aspects of blame, entitlement, racial tension, gender tension, gaslighting, assault, and consequence to the here and now in painful and glaring ways. It’s intense and uncomfortable and far from a leisurely night at the theatre. For all of these reasons, Caught is worth seeing. Caught takes place in a small security room in the back space of a mall where James (Jakob Ehman), a young white male teen, has been caught with a backpack full of thousands of dollars worth of unpurchased merchandise by Trisha (Sabryn Rock), a black female security guard. While processing the paperwork, James does his best to swindle, flirt and otherwise con his way into being let go. He manages to coerce Trisha into a compromising situation as police officer Dan (Meegwun Fairbrother) walks into the room. Playwright Jordi Mand did fine work in creating this piece. The whole performance is 75 minutes worth of escalating tension without scene breaks, showing how emotions and defensiveness can flare in a pressure cooker situation. Like any good procedural prime time drama on TV, there are many layers to the initial story presented in Caught and those revelations add greater urgency and dire consequence to the situation at hand. The fine writing and exquisite direction from Sarah Garton Stanley provided the backdrop for the actors to shine. I was particularly impressed by Fairbrother as officer Dan, who has intimidation down to an art. He is very aware of his imposing stature that quickly drives Trisha and James into their own subconscious corners and yet when he is backed into his own corner, his panic is quite visceral. My guest for the evening, Pelin, felt about as uncomfortable as I was throughout the performance, but it didn’t take away from her enjoyment of the show. We both had mixed feelings on a few of the lighting cues, though, as the lighting increased drastically in heated warm tones as the tension in the room grew. It felt rather on the nose for us–an interesting choice yes, but we felt that what was escalating in that small room didn’t need to be additionally underlined. We also both agreed that the intro and outro music used didn’t fit the theme of the play or of the location being the security room of a mall. The music felt more suitable for a dance floor. But technical aspects aside, Caught ranks up there with some of the best crime dramas on television. It is magnetic and relentless and a fine piece of theatrical art that needs to be seen. 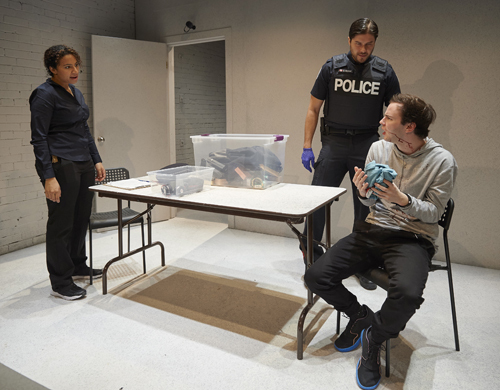 Caught is playing at the Theatre Passe Muraille Backspace (16 Ryerson Ave) until April 24, 2016. Performances run Wednesday to Sunday at 7:30 pm with weekend matinees at 2 pm. Ticket prices are $33 for adults, $28 for seniors, $20 for arts workers with valid ID, and $17 for those under 30. Matinee performances are $22.50 in advance or PWYC at the door beginning at 12 pm. Group rates available for orders of 10 or more at $25 per ticket. Tickets can be purchased online or at the Passe Muraille box office beginning four hours before the performance. Call (416) 504-7529 for more information. Audience advisory: Mature language, violence.